Prospective elementary school teachers (PTs) come to their mathematics courses fluent in using procedures for adding and subtracting multidigit whole numbers, but many are unaware of the essential features inherent in understanding the base-ten place-value system (i.e., grouping, place value, base). Understanding these features is crucial to understanding and teaching number and place value. The research aims of this paper are (1) to present a local instructional theory (LIT), designed to familiarize PTs with these features through comparison with historical number systems and (2) to present the effects of using the LIT in the PT classroom. A theory of learning (variation theory) is paired with a framework related to motivation (intellectual need) to illustrate the mutually supporting roles they may play in mathematical learning and task design. The LIT, a supporting task sequence, and the rationale for task design are shared. This theoretical contribution is then paired with evidence of PTs’ changing growth in their conceptions of whole number before and after courses leveraging this task sequence. Menon, R. (2009). Preservice teachers’ subject matter knowledge of mathematics. 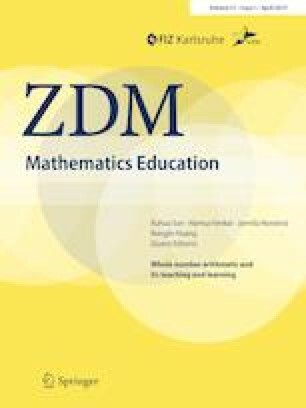 The International Journal for Mathematics Teaching and Learning. Retrieved from http://www.cimt.org.uk/journal/menon.pdf. Accessed 8 Aug 2018.